I finally finished making my Christmas cards, the family all signed them last night and they are addressed and ready to be mailed! If you look closely (click to enlarge), you'll see snowflakes in the Blue Paint under the stamped image. I wanted a subtle background but yet one I could create rather quickly, so I brayered Blue and White Paint onto Gelli Arts Plate, then pressed in the Mini Winter Wonderland stencil from The Crafters Workshop. I placed a piece of White card stock onto the Gelli Plate, then brayered over the card stock to pick up the paint, quickly removed the paper, then heat set. 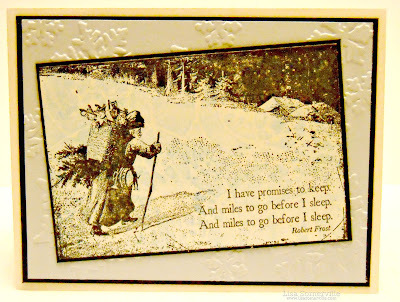 The image is from the Snowy Woods plate by Artistic Outpost, stamped in Black Archival. I embossed the Blue panel with the Sizzix Alterations Snowflake Folder. Love the vintage feel of this card! Beautiful vintage Christmas card! Love what you did with that Gellie plate and I suppose I will have to break down and pick one up! Have a wonderful Wednesday! I just finished the last of my cards and they go out today as well! Now to start the wrapping! Wow - so subtle, and it looks so stunning! 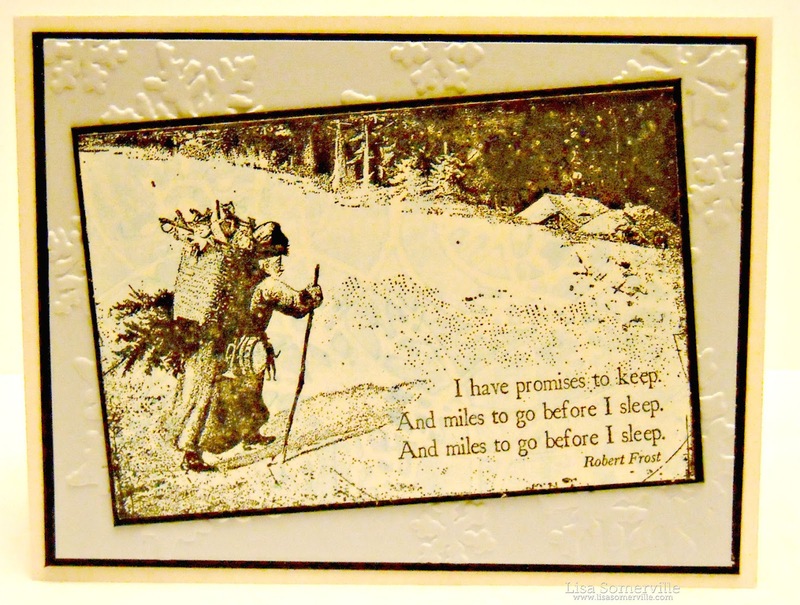 Lovely golden hues and I love that image and poem!